The Down Home Poster Series afforded Dempsey the opportunity to paint local scenes he had known and come to admire while growing up in Davidson County, NC. "These are scenes that I wanted to paint which are special to me. In doing this poster series I tried to capture something unique and meaningful for the locals. It has been rewarding to know that I have touched the hearts and remembrances of so many who have come in to our shop to get copies of these local scenes." For the fourth and final poster in his 'Down Home' series, Dempsey Essick has chosen the "Southern Lunch", a favorite eating spot in Lexington. Herbert Miller Lohr first started serving hot dogs and hamburgers from a small building by the railroad tracks in 1925. He only had a lunch counter and stools in the beginning, and most of his customers worked for the Southern Railroad, so he called his cafe Southern Lunch. The story since 1925 has been one of expansion. First, a few booths were added. Then as the business grew, Herbert moved across Railroad Street to larger quarters. After a long apprenticeship, Fred Lohr took over from his dad in 1958 and after a brief setback in 1977 when lightning started a fire that gutted the building, Fred rebuilt and continued to expland until 1982 when he handed off to his son, Herb, the namesake of the original. Today, Herb and his thirty-five loyal employees can seat 170 customers who may be wearing business suits or blue jeans and might include anyone from Racing Champ, Dale Earnhart, to Baseball Great, Enos Slaughter. In the painting, Dempsey portrays the cafe as it looks to anyone passing on Railroad Street. 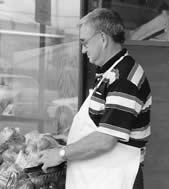 Herb Lohr is visible through the window greeting customers and manning the cash register. On the sidewalk, Fred Lohr stands between Gilbert Barbee on the left and Laverne Owens, the two longest serving employees. Owens rules over the kitchen that has doubled in size twice since he prepared his first Southern Lunch bread- burger. Gilbert, now retired, remembers starting out in the original lunchroom. His storehouse of stories includes most of the famous and near famous who have eaten at the cafe but perhaps the most poignant memory was in 1945, watching the slow passage of the black draped train carrying the body of President Roosevelt from Warm Springs, Georgia back to Washington, DC. In a city famous for its barbecue restaurants, it may seem remarkable than an old fashioned cafe, situated on a street that no marketing survey would recommend, should be so successful for so many years. The answer lies in a number of things. The welcoming attitude of everyone in the dining room, the honest straight forward menu, and the probability that you'll see a friend or neighbor among the diners. The scene that Dempsey has painted is exact in every detail. The color of the brickwork, the chipped paint on the curb and even the public phone on the corner, are all just as they appear. The customers visible through the window are representative of all customers, but if you are sure it is someone you know, then you are probably right. LEXINGTON -- Owners of the Southern Lunch are beginning to piece it back together after fire destroyed the establishment nearly eight months ago. Last week, a crane removed the most of the destroyed roof and now contractors are busy getting the new one on. If Southern Lunch was open, you would find Timothy Dye in the kitchen. "I started when I was 17, I started working [here] back in  and I've enjoyed it ever since," said Dye. But Tuesday a crow bar was his tool of choice. "Just reconstructing the building, right now I am just lifting bricks off the top to get it back together," Dye said of his and others’ efforts.And he's not the only one, his fellow cook Ivey Gordon is also helping out. "We are just like a family; all of us stick together and help each other. We got a good boss man for one thing, so we got to help him," Ivey Gordon, a Southern Lunch employee said. Nearly everything inside the diner was affected by the fire and that means starting from scratch during the rebuilding process. "We had to strip it down to the block walls. So that means new wiring new plumbing, new everything inside," said Herbie Lohr, owner of Southern Lunch. He says it will be the same restaurant the community has always known when it opens again, with maybe just a few changes. "Maybe with a new theme, maybe the train theme," Lohr said. "We've got the depot area being revitalized; we may stick with the train theme." And while the reconstruction has only just begun, Lohr says he can't wait to be back open again. "We've been here 80 years, and that's a lot of history and we feel we can make a lot more history." If everything goes according to plan, the owners hope to have the restaurant open by the middle of summer. Golden Age resident Gilbert Barbee, 84, one of four men depicted in a painting of Southern Lunch by Dempsey Essick, is being presented a signed reproduction by Dempsey as well as the nursing home. 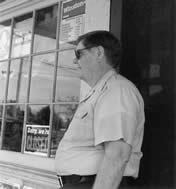 Mr. Barbee worked for over 40 years at the restaurant. "Reeds Crossroads" depicts the intersection of the old US Highway 64 and NC Hwy 150 in northwestern Davidson County as it appeared before the Temple Groceteria and Farabee's Store closed their doors forever. 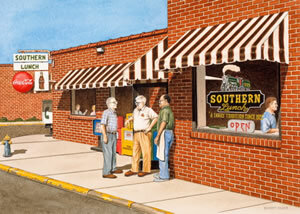 In his painting Dempsey has captured a moment when both stores were at their peak. 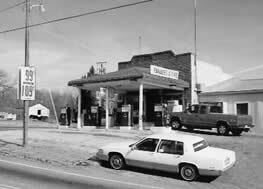 Mrs. Nancy Temple is pumping gas at the Temple Groceteria while Boyd Parnell fills his tractor at Farabee's. Jack Craver stands in the door passing the time of day with Jim Hunt, who at age 95, still opens his cafe across the corner each day to serve lunch less than a hundred yards from where George Washington had lunch on his post-inaugural tour. Dempsey has rendered the colors and details of the scene with the exactness that is his hallmark. Looking into the picture, a viewer feels the soft sunshine and hears the traffic passing by. 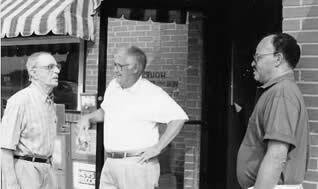 But the spirit of "Reeds Crossroads" is best expressed in the words of Aubrey Temple who said, "We had friends, not customers." 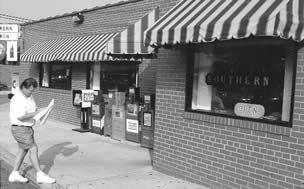 On Feb. 28, 1994 we will close Farabee's Store in "downtown" Reeds Crossroads. 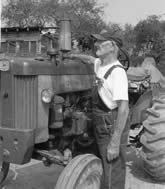 My grandfather, M.P. 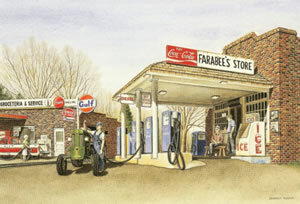 Farabee, built the store in 1927 and operated it until his retirement in 1968. What a pleasure my wife Jeanne and I have had in 25 years of serving the great people in this neighborhood. The greatest pleasure has come from watching little ones get tall enough to see over the counter and later bringing their little ones to stand on tip-toes at the counter. Country stores are leaving the American scene - I for one am sorry to see them go. For the second poster in his "Down Home" series, Dempsey Essick has painted a nostalgic view of the deserted American Children's Home dairy barn which is located on Hwy 47 in Davidson County, North Carolina. 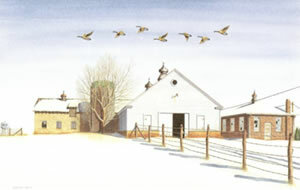 In the picture a flight of Canadian geese passing over the derelict milking barn intrudes on the stillness of a winter day. The raucous call of the echoes from pristine snow fields and through empty silos and buildings that no longer know the bustle of an active dairy herd. Inside the barn all the milking stanchions are gone now and broken windows in the milk house stare out across fields where cows no longer graze. Birds echoes from pristine snow fields and through empty silos and buildings. The Children's Home dairy barn, as a subject for a painting, had been filed away in the back of Dempsey's mind for a long time, just waiting for the right moment. "I've driven by the old barn for years," he said, "and I knew that someday I would use it as the subject for a painting. Then, one day last year, as I was passing, I saw a flock of Canadian geese fly over. There were only three of them but, in that moment I felt that I had found the perfect setting for the second poster in my Down Home series of Davidson County scenes." Having memorable recollections of my growing up at the Junior Order Home, there are many that come to mind of the milk barn, milk house, and cow barn. Twice a day the cows would be gathered at the gate and file over to the milk barn. There were thirty stalls and almost every cow would return to the same one each day. It only took a day or so for the new milk cows to settle on a particular stall and stick with it. The milking crew would get up around 4 am to start our first milking. After that we would clean all the buckets, strainers, and cooling equipment for storage in the milk house. After attending to all our other chores and going to school in the morning, it would be to do all over again in the afternoon. It was in that time before our second milking that I can remember being caught up with our duties and I would lie down outside the milk barn on a cold day in the sun and fall asleep in the grass against the building for a short nap. The barn would block the wind and it felt like an Indian summer on many a winter day. These are just a few memories I have from my days around these barns and I will never forget them. 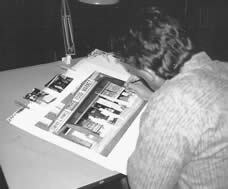 "I am thankful to have captured the memories of the old dairy barn as it burned down on September 19, 1994, two years after the print was released" Dempsey shared. The American Children's Home was opened in 1928 on 320 acres of land in Davidson County, North Carolina. Originally, 120 acres as designated for a dairy farm but in the later years, before the farm was closed in 1979, beef, pork, chicken and vegetables were also raised on the property. Former milk-boys, who milked at 4:30 in the morning and at 4:30 in the afternoon, seven days a week, and did all the other cleaning and feeding chores, say that the experience equipped them to go out into the world when they became eighteen, confident that they could succeed at whatever they chose to do with the rest of their lives. "It has been my pleasure since 1989 to create the annual Christmas card used by the American Children's Home. Each year the original painting is reproduced into 5,000 cards and mailed to supporters." 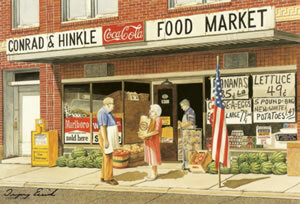 The Conrad Hinkle poster shows Dempsey's Uncle Barney in the store's doorway, as well as long-time proprietor Dwight Hinkle standing outside, both men dressed in their characteristic white aprons. Hinkle is speaking to a regular customer, Mrs. Sam Everhart, whose grocery bag includes as container of pimiento cheese that she regularly ships to an out-of-state relative. Inside the large glass windows of the store, the viewer sees the old-fashioned, bottled Coca-Colas, and outside are stacks of cool, green watermellons, and baskets of red, country tomatoes, ripe peaches and cantaloupes. Look a little closer in the window and you will see a poster for the Davidson County Agricultural Fair, as well as a bumper sticker advertising the 1991 Lexington Barbecue Festival. Customers and tourists come from all over the Piedmont to visit Conrad & Hinkle and most don't leave without buying the delectable homemade pimiento cheese first made by Bruce Hartley in 1948, his first year of employment at the market. Since then, the pimiento cheese has become second only to barbecue as Lexington's most sought-after culinary specialty. Located at 6 North Main Street, in Lexington, North Carolina, Conrad & Hinkle was founded in 1919 by W. E. Conrad and E. Odell Hinkle. The store provided delivery service to its customers in the days when telephones and cars were scarce. Dwight Hinkle, son of E. Odell Hinkle, began to work at the store at the age of nine, where he learned to slice bacon in the cut-to-order meat department that remains today. Barney Allen, hired at the age of 15 as a delivery boy, hauls in locally grown produce that he hand selects. Dwight Hinkle, sharing his thoughts about the store's says, "The last time the store was remodeled was in 1950, and customers liked it that way. They say they enjoy the feeling of stepping back in time, seeing the same decorative tin ceiling, green concrete floor and paddle fan spinning overhead that their grandparents before them saw. We knew we couldn't compete with the big food chains, so we tried to be unique. We want to thank our customers, employees, and former employees for their loyalty over the years. Without them we couldn't have made it this long." The store is now run by Jimbo and Lee, marking the third generation of Hinkles that Barney Allen has worked with through the years.